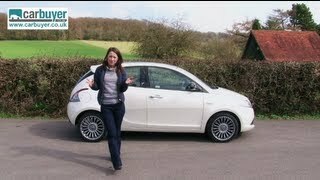 Lancia had revealed the new generation Ypsilon 2012 at the Geneva Auto Show 2011, and from the very first glances you can tell that the new model has grown and comes with lots of enhancements and fundamental changes when compared to the previous models. The very first thing you notice is the fact that the new Ypsilon is now a 5-door hatchback but retains the traditional 3-door look. The rear passenger doors are seamlessly implemented and resemble what we've seen so far on the Alfa Romeo 147 or the Seat Leon, where the door handles are mounted near the C-pillar. Lancia promises that although the hatchback remains in the B Premium segment, it offers a surprising amount of room and comfort. The Ypsilon measures 384 cm in length, 157 cm in width and 151 in high, with a wheelbase of 239 cm. Supposedly, the new hatchback can accommodate up to five people and still deliver the most generous boot in its segment. Despite the fact that the rear passenger area has not been increased, a high level of legroom and comfort has been achieved by fitting "slim seats". In terms of what makes it tick, the new model comes with a range of four engines. The smallest is the 0.9 liter TwinAir engine, which alongside a DFN semi-automatic gearbox delivers 85 horsepower and 145 Nm of torque at 2,000 RPM. The 0.9 liter engine is the most economical and it's perfect for city use, mainly because it comes along with a button that enables an "eco-friendly" mode. With the push of this button the torque is limited at 100 Nm, delivering lower CO2 emission levels and fuel consumption. The second engine is a 1.2 liter Euro 5 compliant engine that comes along with a start/stop system (as all the other petrol and diesel engines) designed for fuel efficiency. Despite the fact that this unit is 0.3 liters larger than the TwinAir, it develops 16 horsepower less, for a total of 69. Next in line is a 1.3 liter turbodiesel MultiJet II engine developing 95 horsepower at 4,000 RPM and 200 Nm of torque at 1,500 RPM. Last but not least, there's the dual-fuel (petrol-LPG) 1.2 liter Euro 5 compliant unit that produces69 horsepower and 110 g/km of CO2. Other key features found in the new Lancia Ypsilon 2012 are the LED tail lights, LED "adaptive" daytime running lights, xenon front lights, 3 interior trim levels, 17 body shades of which 4 are two-tone, 3 choices of alloy wheels, a Blue&Me-TomTom Live 2 infotainment system and a black kickplate with illuminated logo, just to name a few. Overall, the new Ypsilon looks promising and it might catch the attention of hatchback enthusiasts. What are your thoughts regarding the new model?